Tree removal in NJ might seem like a fairly easy task. After all, you chop the tree down, you clean it up, and you throw it away. Despite how simple the process might seem, all tree care work is hazardous and tree removal is particularly dangerous. There are all sorts of things that can go wrong when a homeowner tries to remove his or her own trees. Amazing Tree Services is committed to your safety and the aesthetic of your property. When we perform tree removal in NJ, we take measures to ensure careful, precise removal no matter a tree's location on your property. Likewise, our meticulous quality standards emphasize your satisfaction, providing you with space on your property that you can re-envision any way you'd like. Whether your tree is diseased, dying, dead, or you just want direct sunlight warming your swimming pool, our professionals have the passion and professionalism to complete your tree removal project efficiently and affordably. Gravity: Once a tree starts to fall over, you are no longer in control. Even if you use ropes and cut indentations to influence the way it falls, it may not fall the way you intend it to. When this happens the tree could fall on a home, power lines, or even people. Decaying Wood: A tree that is dead or dying will start to decay from the inside out. When this happens it makes the tree very unstable. Even professional tree removers will opt for a crane to remove a deadwood instead of chopping it down. Fortunately, we have our own crane available for such instances. If there is any reason for you to believe your tree is dying or decaying, you need to have it removed by a professional as soon as possible. The unfortunate truth is a decaying tree is unstable enough to fall without warning. Power Lines: Tree removal in NJ is always dangerous, but power lines make the task even more of a safety risk. You should always assume the wires are live. You should also know the black coating on power lines is not an insulation to protect you from being electrocuted. This is just a myth. The black coating is just weather-proofing and you can still get electrocuted. 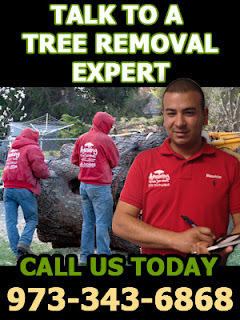 The short answer to the question is: yes, you always need a professional to remove a tree from your property. DIY tree removal in NJ is not worth the safety risk it involves, and chances are pretty good it will create more problems than it resolves. For more information about tree removal in NJ, call Amazing Tree Services at (973) 343-6868. Land clearing is the process of removing trees, brush, and other types of flora from a piece of land. Depending on the size of the land, the location of the land, and why the land is being cleared, excavation may also be required. In most cases, one of three types of land clearing in NJ methods will be used: cut and grind, pushover, burning. Amazing Tree Services provides real estate developers with smooth, even land free of obstructions including trees, debris, boulders, and other natural materials impeding your construction project. With our own trucks, equipment, and crane, we personally oversee all aspects of your land clearing project, ensuring beautiful results both within your budget and time-frame. No matter the size of the job, land clearing in NJ is an important step to mold land to your vision. Our methods and practices have made us a trusted provider of land clearing, having worked with New Jersey land owners for many years. Below, we'll briefly describe the three types of land clearing and how each benefits or can cause problems on your property. The first step in the cut and grind land clearing method is to cut down all of the trees on the land being cleared. While the trees are removed, the stumps are left in the ground. Then, a large piece of construction machinery is used to pull the stumps out of the ground so they can be ground into mulch. At Amazing Tree Service, we pursue land clearing in NJ using this method, our experienced professionals eager to fall trees and haul them off your property. Just as the name suggests, the pushover method involves using heavy duty construction equipment to push over the trees. Then, the trees, brush, and other flora are removed from the land with their roots still intact. It is very common for the trees to be sold or ground up to be used as a mulch. The burning method is the most dangerous option for clearing land. This method involves setting a controlled fire and allowing it to continue to burn until all of the trees, brush, and other flora have burned to the ground. Once everything has burned, the fire is extinguished, and a bulldozer is used to finish clearing the land. This method may not only negatively impact your land, but is not good for the environment surrounding your property. It is important for the owner of the land to know that land clearing in NJ leaves the top layer of soil open and exposed to natural elements and erosion. You can preserve this top layer of soil by planting grass on it. In the long run, it is easier to remove a patch of grass than to import new dirt. For more information about our affordable land clearing in NJ, call Amazing Tree Services at (973) 343-6868. Do you have a stubborn stump taking up space in your front yard? What about a slowly dying tree leaning precariously over your patio? While trees are important parts of a healthy landscape, they can also be unsightly or dangerous. At Amazing Tree Services, we provide homeowners and commercial property owners with affordable tree removal services. Our expert methods and professional team deliver quality results without delay. No matter the complexity of the project or where a tree is located on your property, we have the equipment and vehicles to promptly remove the tree and carry it away from your property. Our affordable tree removal cost in NJ gives you the safety or aesthetic quality you are looking for without breaking your budget. While there are certain times where a qualified homeowner may be able to take care of his or her own tree removal— such as cutting away small branches—most instances of tree removal require professional help. Hanging branches or rotting trunks can cause serious injury or even death if improperly disposed of: One wrong cut with your power tool and you could be knocked out by a heavy branch. When your physical health and property are on the line, why not let an expert take care of your tree removal for you? Tree removal cost in NJ will vary depending on the size and type of tree you need cut down. There also may be extra service costs incurred if you want additional tree-removal services, like stump removal or log splitting. Generally speaking, smaller trees (under 25 feet tall) will cost less money to remove, while larger ones will cost more. Certain kinds of trees, like oak, are particularly dense and tough, so tree removal services will often charge extra to tackle them. It is also important to note that the condition and location of the tree will affect the tree removal cost in NJ. Healthier trees are more expensive to remove, while dead or dying trees will cost less. Additionally, trees located away from power lines and houses will cost less to remove, since maneuvering around easy-to-damage property with tree removal equipment requires additional labor. Most of us love trees. But when our property or lives are endangered by improperly cared for trees, it’s time to take action. Call a tree removal company today to help you remove the stumps, branches, and trunks you need to! For more information about a tree removal cost in NJ, call Amazing Tree Services at (973) 343-6868. Look outside your window and notice the bounty from nature that are trees. Trees exist all over the world, in different shapes, colors, sizes, and uses. Trees not only produce fruit and house all sorts of animal life, they provide us with precious oxygen that keeps the entire world going one breath at a time. But when these trees don't complement our properties, we have a problem. Sometimes they get their own ideas and grow in all sorts of crazy directions. Other times, they begin decaying or breaking apart and there's little you can do about it. That is, until now. Our tree experts are at your service and are ready to provide quality tree service in NJ. Amazing Tree Services performs many aspects of tree service in NJ to beautify your property - or make it a more safe environment. Our tree specialists are knowledgeable about trees native to New Jersey and how best to care for them, prevent disease, or remove them from your property. We feature affordable prices and professional, prompt service. No matter the size of tree or its location on your property, we will find a winning strategy to improve its appearance, maintain, or remove it without delay. But the question still remains - what tree services do we provide? Trimming your trees is more than keeping them looking fresh. Regular clippings can remove diseases before they spread and keep your trees growing tall and bountiful, just as they were meant to. This can aid in fruit growth, and also keep the trees alive for longer than they would have otherwise. Sometimes you just want to get rid of those problematic trees. Never fear. If your trees are on their last legs and you want to put them down, we'll do it for you in a safe and effective manner. Or maybe you just want to get rid of what you have so you can make way for something new. Either way, our professionals are well-experienced in this tree service in NJ. We also offer lot clearing and other services to help you get an area ready for future building. Contact us today and find the perfect tree service in NJ for your needs. For more information about affordable tree service in NJ, call Amazing Tree Services at (973) 343-6868.